NOTE: I use only organic and non-GMO products in my recipes. **This batch was actually all of the carrot fiber left over from that morning’s juicing. It is the equivalent of shredded carrots with the moisture removed. The vegetables for this batch was an organic “Santa Fe” blend which consisted of red beans, carrots, broccoli, and green beans. 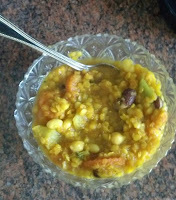 +organic red lentils are soaked overnight. Side note: I have a gluten sensitivity, not an allergy and I am a MAJOR raw foodie/green smoothie addict. A hearty stew like this is a nice way to satisfy my craving for starches since I do not consume pasta or rice. TRIVIA: Did you know that corn starch is BAD? Yes, it's a genetically modified food which has been shown to cause health problems. The healthy alternative to thicken stews, soups, and sauces is to add ground oatmeal.